Over 57,000 runners taking part in the world's biggest half-marathon, a record-breaking fifth win for Sir Mo Farah, a second win for Vivian Cheruiyot, David Weir setting a new course record to win the men's wheelchair race for the seventh time and Martyna Snopek taking the women's wheelchair race. It's been some day in Newcastle! We also had the Archbishop of York 'blessing' the course, celebrities such as Olly Murs pushing themselves through the pain barrier and some ridiculously fabulous fancy dress costumes. Thank you for joining us. And if you've been inspired to take up running, check out this Get Inspired guide on how you can get started. BBC Sport have been capturing all the best of the Great North Run in our Instagram story, including a little message from Olly Murs. Head to the BBC Sport Instagram account to see what he had to say. James Stringer: Always absolutely amazed at all the wonderful, determined people who participate in the #GreatNorthRun year in year out for individual reasons! Always inspiring and always makes me think ‘one day’ Well done to EVERYBODY! Mo's wife, Tania Farah, achieved her personal best in the half marathon by finishing in a time of one hour and 45 minutes. The mother of four was motivated by other mums who are out there "killing it." In case you missed it, here's the moment Mo Farah crossed the line to win a record fifth Great North Run. Gillian Lathan:Congratulations to David Lathan on running his first #GreatNorthRun today! Started running last year on GNR day and has done remarkably well. James Petherick: Whatever happens in my life and wherever it takes me, I will never, ever not be proud of where I’m from. The North East - what a place, what amazing people. Louise Shrieves: Good luck to my husband John Shrieves and Connie’s and Archie’s dad running the GNR. We are so proud! Olly Murs told BBC One that he had to hold back the tears at the finish line. Judging by this picture, he wasn't really holding them back. A great effort by Olly, who hopes to be back next year. If you want to take part next year, the date for your diary is Sunday, 8 September 2019. "I got a great message from Andrea Westcott*. She said 'it's not the pace you do it's the time you've have' - and I've had a great time. "It gives you that boost. It doesn't just last today - it lasts forever, so I recommend it to anybody. 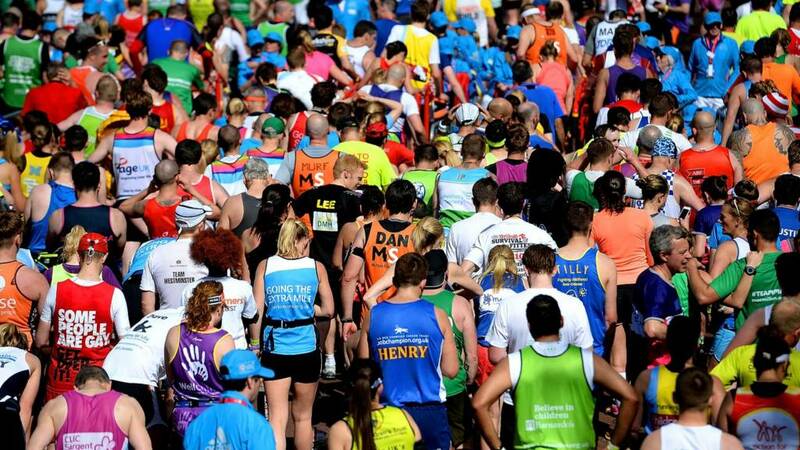 Come and do the Great North Run!" *not sure whether she meant the triathlete or someone else! Deb Charles: Rizz Sisson. You may put yourself down, but we are so proud of what you are doing. Love from the Charles family sat on our sofas. Beverley Fisher: Please give a shout-out to Matt Pagan of @Collabro who was singing to 1000's supporting Barry Manilow at the O2 last night. He's normally used to topping the charts, but Olly Murs couldn't pip Mo Farah to a number one finish today. But has has finished his first ever Great North Run. "That was amazing, it really was. I had to hold back the tears," he told Gabby on BBC One. "It was so tough. The North East crowd are amazing, kept me going. And where did the sun come from?! It's been unbelievable, an amazing occasion. "I was planning to run alongside my sister but everyone was pushing through and I lost her and then Nell McAndrew ran past me, I was determined to catch up with her but she was just gone. "I was watching last year crying my eyes out at all the different stories, so I wanted to do it this year. "I find running so therapeutic for me mentally, especially the industry I am in. It's nice to go out for 10 miles on my own and just do it." We've had some serious entries for costume of the run today! From rubber ducks to dial up phones and now a Rubik's Cube! And talking of volunteers .. do you know anyone who dedicates their free time to help people participate in grassroots sports and fitness activities? We are once again asking you to champion an Unsung Hero from your area. Send your nominations today! Find out how. Thanks to everyone helping out around the course today to keep it running (no pun intended) smoothly. Mo Farah's wife Tania has been speaking to Gabby after breaking her personal best and coming in at one hour 45 minutes. "My kids have had a big part to play in my running." she said. "Mo influences me a lot, I got a taste of it two years ago and my kids get more excited seeing me run than their dad. "I wanted to prove that Mo isn't the only one that can run and wanted to show that Mums can do this and it's great to see so many Mums are getting better times than me. "That's why I did this race, the crowd really carry you - it's the best race for atmosphere, there's no other crowd like it." Sarah, who lost her sight seven years ago, is taking part today. The 46-year-old works as a disability adviser in Nottingham and first took up running to boost her confidence. Sarah Walworth: Good luck Martin Walworth from Sarah Lewis and Harry in Keighley, West Yorkshire. Jess: I am so proud of my sister Sophie running the Great North Run today for meningitis. She is an incredible woman and I will always be inspired by her strength. Andrew the Assessor: good luck to my brother and sister running their first Great North Run. Mo Farah seals an unprecedented fifth consecutive Great North Run victory in Newcastle. Tania Farah, wife of multiple Olympic champion Mo, says their children are more excited to see her run than their dad after she completed the Great North Run. Sir Mo Farah takes a record-breaking fifth victory as cheering spectators line the route. Britain's Mo Farah wins a record fifth Great North Run in Newcastle on Sunday. Yvonne Wadeson will be running the Great North Run with members from the 'Sisters with Blisters' Facebook group, a community of over 4,500 members which she set up last year. BBC Get Inspired has teamed up with Public Health England to bring you the Couch to 5K challenge, aimed at getting you running 5K within nine weeks - even if you've never run before. Louise Roberts had to pull out of last year's Great North Run after being diagnosed with breast cancer. Dave Wilkie, 86, is taking on the 13.1 miles again with his son and grandson. Claire Coulthard describes how exercise helped her overcome mental health problems, as she prepares to take part in the 2018 Great North Run. Sarah never thought exercise was for her after she lost her sight seven years ago. Swimming volunteer Kirsty Ewen is the BBC Get Inspired Unsung Hero for 2018.